Stillwater Getaway - Newly Renovated with Bonus Room and walk to the lifts! 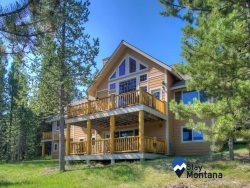 This newly remodeled end unit condo in Stillwater has a premier location in the mountain village of Big Sky Resort. Nestled across the street from the Yellowstone Conference Center, restaurants, shopping and all the mountain activities at the base area of Big Sky Resort. This studio offers a private sleeping area, nicely appointed living area, gas fireplace, ski locker, and outside balcony overlooking Andesite mountain. Recent updates include kitchen cabinets, granite counters, appliances, flooring, leather sofa sleeper and queen bed. - Outstanding location - Minutes from Big Sky Resort, 6.3 miles from Big Sky Town Center, 57 miles to West Yellowstone Entrance. - Electric Range,Kuerig Coffee Maker,Toaster, Blender, Roasting Pan, Bakeware, 4 Place Settings, Basic Spices, Trash Bags, Dish Soap, Dishwasher Soap, Sponge, and Paper Towels.